A powerful computer program should be founded on advanced theory and be verified by tests and practice. The DYNAN program follows these guidelines. DYNAN is based on the improved Novak’s method where a non-reflective boundary is formed between the near field and the far field to account for the mass of soil in the boundary. The program yields the dynamic response of both shallow and deep foundations under harmonic, transient, and random loadings. Such loadings can be produced by rotating or reciprocating machines, earthquake, wind, blast, sea waves, and other sources. The foundations (or caps on piles) are assumed to be rigid, and all six degrees of freedom are considered as coupled. The foundation stiffness and damping constants are also returned for possible use in soil-structure interaction analysis. The stiffness of the supporting soil along with damping constants needed for the analysis and evaluated in the program for surface foundations, embedded foundations, and pile foundations. Soil layering, a possible weakened zone (see sketch) around a foundation, and pile-soil-pile interaction are all taken into account. The computational method has been applied to important engineering practice (Han, 1987, and Han, et al, 1999). To investigate soil-structure interaction, a series of dynamic experiments were performed on full-scale mat foundations (Han, 1989) and on full-scale piles (Han and Novak, 1989, 1992). The elastic wave energy from foundation vibration was dissipated in three dimensions as radiation damping. The soil is not a perfect elastic medium as assumed in the theory and the experiments showed that damping is overestimated in the computation. For practical purposes, the damping is reduced in DYNAN based on experimental results. DYNAN can be used for the dynamic analysis under transient and random loading in the time domain. It also can be used for harmonic loading in the frequency domain. By means of a substructure method, the dynamic response of superstructure is calculated using a finite element program, such as SAP2000, and the stiffness and damping of foundation are generated using the DYNAN program. 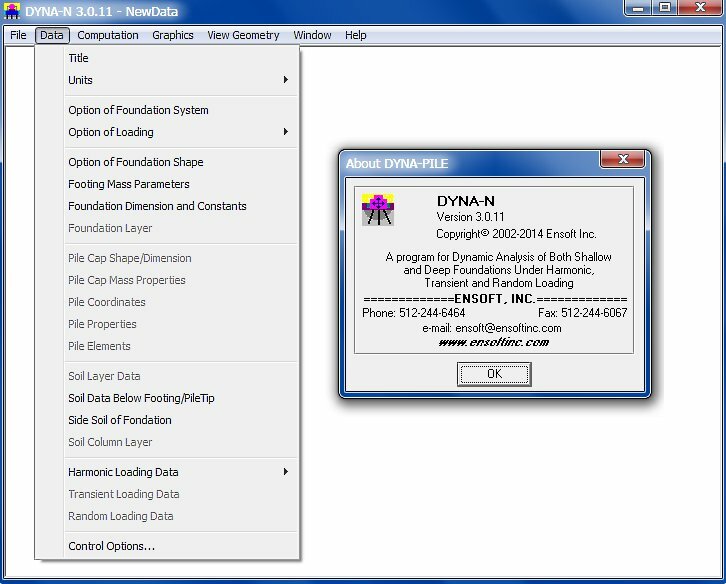 * DynaN download link provides demo version of the software. DynaN has been rated 4.0 out of 5 points. A total of 1 votes cast and 0 users reviewed the software.